Global M&A activity has reached record levels so far this year, but investment banking fees overall are down slightly. 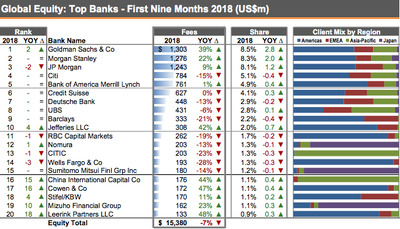 JPMorgan held the top spot for total investment banking fees in the first nine months of the year, with Goldman Sachs taking second place. 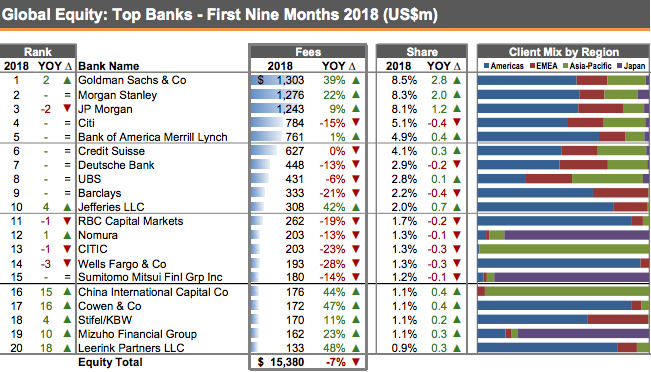 JPMorgan held the top spot for the total investment banking fees in the first nine months of the year, with Goldman Sachs taking the second spot. 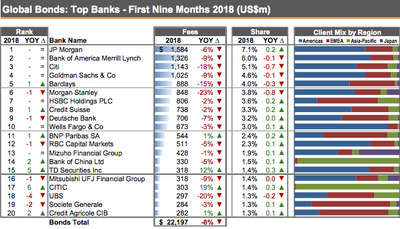 Here’s how the banks stacked up this time around. 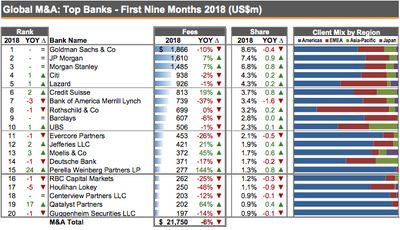 JPMorgan tops the table for total investment banking fees. 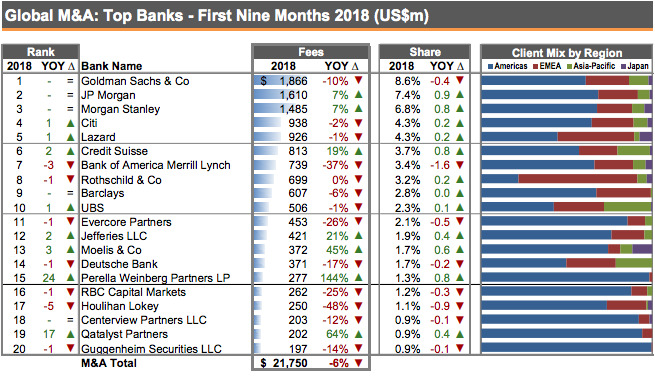 JPMorgan has a 7.1% wallet share and $US5.5 billion in fees during the first three quarters of 2018. It’s followed closely by rival Goldman Sachs, with $US4.7 billion and a 6.1 % share. Morgan Stanley climbed two positions to take the third place. Goldman Sachs tops the table for M&A. Goldman Sachs ranks first for M&A, with roughly $US1.9 billion in fees, ahead of JPMorgan in second, with $US1.6 billion. Fees from M&A have slowed slightly this year, standing at around $US21.8 billion which is down 6% from a year ago. Goldman Sachs topped the charts equity capital markets too, ahead of Morgan Stanley and JPMorgan. Total ECM fees are down 7%, dropping to $US15.4 billion. JPMorgan ranks number one in debt capital markets, ahead of Bank of America. Debt capital markets activity has also dropped moderately. Industry-wide fees stand at $US22.2 billion, which declined by 8% from a year ago. 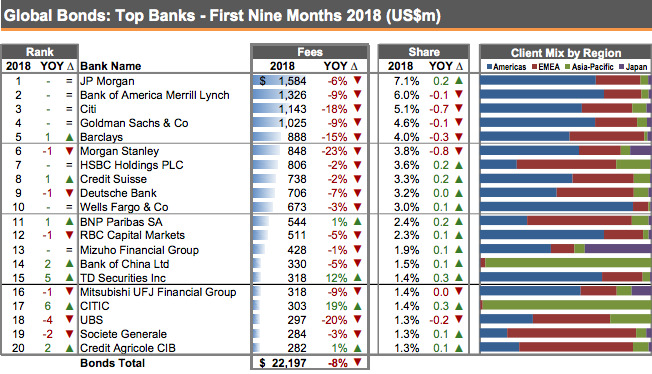 JPMorgan ranked number one here ahead of Bank of America Merrill Lynch and Citigroup, generating $US1.6 billion in fees. 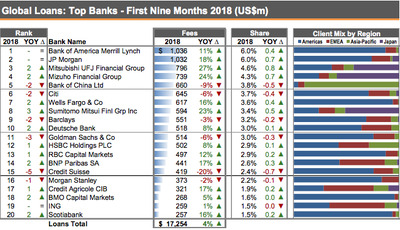 And in loans Bank of America ranks first. 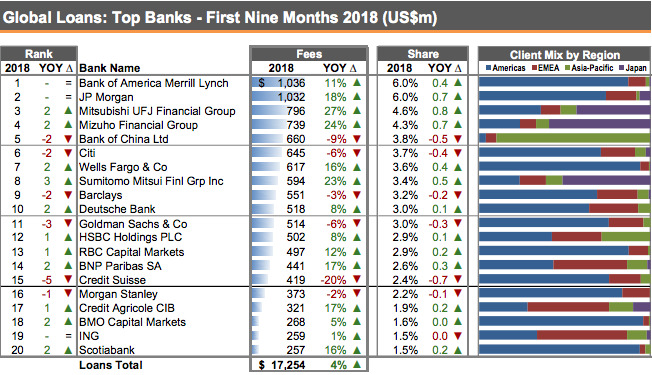 Bank of America ranks number one in syndicated loans, ahead of JPMorgan and Mitsubishi UFJ Financial Group, with $US1 billion in fees.